There are many joinery companies, but those listed here have produced high quality joinery of a traditional nature. Agrell Architectural Carving is a 37 year old family business directed by Master Wood Carver Ian Agrell. As high-end commercial woodcarvers, they have large capacity production capabilities, offices in the UK, Europe and USA and dedicated Project Managers. The company specialises in high quality, bespoke and decorative architectural wood carving projects including architectural mouldings, capitals, brackets, panelling and furniture for residential, commercial and religious projects worldwide. They recently launched a product line of hand carved architectural appliqués, brackets and mouldings. Atkey and Company are makers of exemplary period doors and architectural joinery, offering a catalogue of authentic, accurately reproduced designs from the best known periods of British architecture, each complete with its historical context. We supply beautiful, high quality traditional joinery products (doors, timber mouldings and wall panelling) which also meet modern performance standards. Our marketplace ranges from defining and reinstating lost detail to period and heritage properties (for instance, Grade 1 listed houses by John Nash and Sir John Soane) to creating whole house schemes for one off, classical new build properties. H & K Mabbitt Ltd, are a specialist joinery company who have many years’ experience in the design and manufacture of ecclesiastical furniture and wood carving. Our clients include St. Albans Cathedral, Westminster Abbey, St Pauls Cathedral and the British Museum, amongst other highly respected institutions. We are happy to visit site to survey and advise on constructional techniques and materials, and produce design drawings for approval. Located in High Wycombe and with over 50 years’ industry experience, Kirkman Joinery have worked with both homeowners and businesses alike to provide high quality bespoke timber joinery. At Kirkman Joinery, we specialise in providing a service which runs seamlessly from start to finish, manufacturing and installing a wide range of high quality products which includes windows, doors, staircases and bi-folds. Merrin Joinery designs, produces and installs bespoke wooden windows, doors and staircases. We work exclusively on historic & listed buildings. Each item is individually made in our workshop to meet the exact requirements of the client. Precisely matching original architectural details.Past commissions have included: Single glazed sash & casement windows, Slim line double glazed windows, Curved windows, Arched door sets, Winding staircases, Joinery for barn conversions. We can supply and install purpose made stone cill's and are experienced in using lime mortar and plaster. Our client base extends throughout the UK. Whether it’s a new build or restoration, Venables can produce custom made joinery to compliment your project. 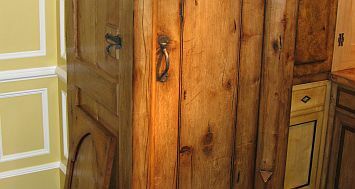 Our stock of Oak doors includes ledged and braced, four panel and half glazed as well as made to measure bespoke doors. Our Oak windows are craftsman made from top quality materials with great attention to detail. We have years of experience in helping the customer to choose a design that suits your property’s style and period. Also bespoke staircases, furniture, skirting, architrave, door linings and flooring. Visit our website to see the joinery items we produce as well as mouthwatering previous projects.